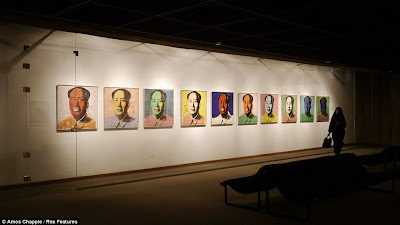 A 2011 Andy Warhol exhibit at The Museum of Contemporary Art in Tehran, Iran. Iran is in the news a lot these days. Perhaps more than usual. There’s constant chatter about the upcoming presidential election as campaigns heat up. There are overhyped reports and baseless accusations about Iran’s nuclear program. The United States Congress wants desperately, per the demands of their AIPAC benefactors, to impose a total trade embargo on the Islamic Republic, as the Canadian government has literally done just that, despite widespread acknowledgement that the heaping on of more and more sanctions against Iran is ineffective – and dangerous – policy. A bumbling, bipolar used-car salesman accused of being deployed by the Iranian government to hire a Mexican drug cartel to assassinate a Saudi Ambassador in Washington D.C. just received a sentence of 25 years in prison by a U.S. District Court. The usual cadre of neoconservative regime change advocates are continuing to publish the same worn-out warmongering screeds that they’ve been writing for the past decade. But there are other stories about Iran, too. Ones that, amazingly, don’t include talk of enriched uranium, spinning centrifuges, elections, sanctions, or bombing. There are stories about young Iranian women practicing parkour on the streets of Tehran, Esfahan, and Lahijan. And stories about innovative and inspiring Iranian fashion designers Farnaz Abdoli and Shadi Parand. A beautiful photo essay, published Thursday May 29, 2013 by London’s Daily Mail, shows a side of Iran seldom seen in the mainstream Western press. Photographer Amos Chapple, during the course of three separate visits to Iran, snapped some incredible images, contrasting ancient villages with bustling cityscapes. 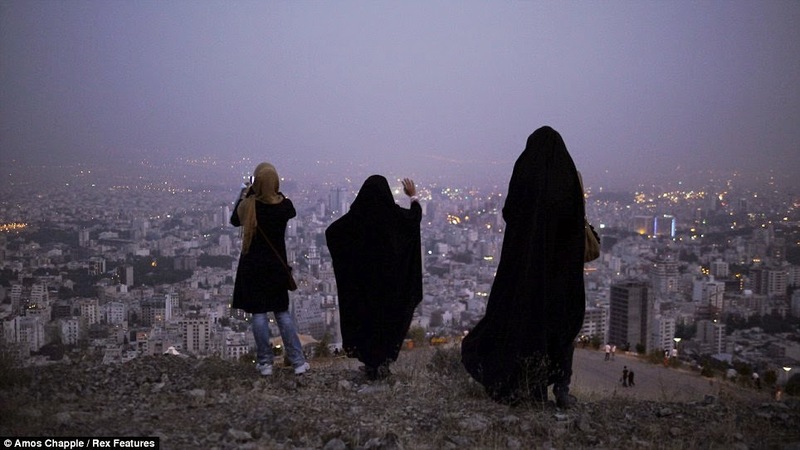 ”‘I was amazed by the difference in western perceptions of the country and what I saw on the ground,” Chapple explains, echoing the sentiments of nearly everyone who has ever visited Iran with preconceived notions. Watching the video below and listening to the incredible music, you’d almost be forgiven for believing there’s hope yet for peace and reconciliation. From NPR's Anastasia Tsioulcas: Every Tiny Desk Concert provides its own particular thrill, but it’s not every day that we get to welcome one of NPR’s 50 Great Voices to our offices. With the visit of the incredible, honey-voiced Mohammad Reza Shajarian from Iran, we lucked out by having him sing on not just any day, but on the biggest holiday of the Persian calendar: Nowruz, the New Year. Joined by three excellent collaborators, brothers Sohrab and Tahmoures Pournazeri (celebrated musicians in their own right as leaders of Iran’s Shams Ensemble) and French percussionist Robin Vassy, Ostad (“Master”) Shajarian gave what amounted to a brief master class in the art of singing. In the course of this love song, titled “Az Eshgh,” Shajarian unleashed torrents of swooping, soaring, goosebump-inducing sound — still perfectly controlled at age 73. Last week, a threatening letter laced with the deadly chemical ricin was sent from Shreveport, Louisiana to New York City Mayor Michael Bloomberg as a response to the mayor's outspoken support for stricter gun control laws. Two identical letters, also containing the lethal substance, were addressed to both President Barack Obama and the head of the Washington D.C. lobbying group, Mayors Against Illegal Guns, which is managed and funded by Bloomberg himself. "You will have to kill me and my family before you get my guns. Anyone wants to come to my house will get shot in the face. The right to bear arms is my constitutional, god-given right and I will exercise that right till the day I die. What's in this letter is nothing compared to what I've got planned for you." Despite lethally targeting civilians and non-military officials far from any active battlefield, no one is referring to these acts as terrorism. Not the press, not political pundits, not the intended victims. No one. 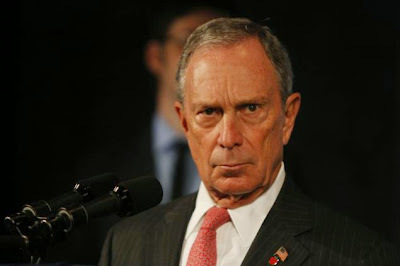 In fact, Bloomberg himself was nonplussed by the whole ordeal, telling reporters on Thursday May 30, "I'm not angry. There are people who I would argue do things that may be irrational, do things that are wrong, but it's a very complex world out there and we just have to deal with that." Yes, Mike, it is a very complex world. This world is so complex, in fact, that an easily identifiable act of terrorism isn't considered terrorism for one simple reason: it probably wasn't committed by a Muslim, but rather by some white guy in the South. Clearly, while white guys who send murderous mail are merely acting irrationally and doing something wrong, potential violence by members of the Muslim faith present a singular threat to our civilized society. So much so, in fact, that Michael Bloomberg himself believes our own laws and the bedrock of that very society are not good enough to defend against such a scourge to humanity. At a press conference at the Lower Manhattan Security Initiative, Bloomberg said, "The people who are worried about privacy have a legitimate worry. But we live in a complex world where you're going to have to have a level of security greater than you did back in the olden days, if you will. And our laws and our interpretation of the Constitution, I think, have to change." Yes, how complex it is. So complex that, although a 2010 study by Duke University and the University of North Carolina found that Islamic terrorism accounted for only six percent of all terrorist attacks in the United States between 1980 and 2005 while a 2012 analysis by the Center for American Progress reported that a whopping "[f]ifty-six percent of domestic terrorist attacks and plots in the U.S. since 1995 have been perpetrated by right-wing extremists," Michael Bloomberg has made it his duty to illegally spy on and harass Muslim communities in the New York Metro area. Bloomberg has presided over a massive, illegal covert domestic surveillance and ethno-religious profiling program that have targeted, alienated and traumatized Muslims throughout the Northeast, despite the fact that, following the September 11, 2001 attacks, more Americans have been killed in right-wing terrorist plots than by Islamic terrorists. "NYPD surveillance has impacted every facet of American Muslim life," explains Nermeen Arastu, a volunteer attorney with the Asian American Legal Defense and Education Fund (AALDEF), which co-authored a March 2013 report entitled, "Mapping Muslims: NYPD Spying and Its Impact on American Muslims." "The program has stifled speech, communal life and religious practice and criminalized a broad segment of American Muslims," Arastu added, "The isolationism that comes with being a 'spied on' community means that American Muslims are getting a fundamentally inferior opportunity to exercise their constitutional rights." But, for Mayor Mike, just because a white guy tries to kill you via the postal service doesn't mean white people in general deserve to be spied on, rounded up, marginalized, and profiled. Keep calm and carry on, he says. These things happen. This morning, on Chris Jansing's MSNBC show, USA Today Washington Bureau Chief Susan Page said it was "probably not fair to taint the entire gun rights movement with the actions of this disturbing letter because there is a serious debate and two sides to it when it comes to the issue of guns." Jansing agreed. "Yeah, and it's unfortunate that, for a few, it comes to this," she said. Not fair, she said. Unfortunate, she said. Last year, Bloomberg defended his Muslim surveillance program, claiming, "Everything the NYPD has done is legal, it is appropriate, it is constitutional," and, unsurprisingly, by invoking that sacred strawman: 9/11. "We have not forgotten the lesson of that terrible day on 9/11," he insisted, sanctimoniously adding, "We have to keep this country safe...Remind yourself when you turn out the light tonight." Bloomberg's insistence that, "We don't target individuals based on race or religion. We follow leads," is fascinating because, just six months after he said this, an Associated Press report on court testimony by the NYPD stated, "In more than six years of spying on Muslim neighborhoods, eavesdropping on conversations and cataloguing mosques, the New York Police Department's secret Demographics Unit never generated a lead or triggered a terrorism investigation." But Bloomberg's targeting of Muslims isn't his only method of rooting out the evil that lurks in the hearts of brown men. A month ago, the billionaire mayor defended his racist Stop-and-Frisk policy by invoking - what else? - the ever-looming conversation-ender: the constant scourge and fear of terrorism. "Look at what's happened in Boston," he said. "Remember what happened here on 9/11. Remember all of those who've been killed by gun violence and the families they left behind." Again he even claimed that our own laws and efforts not to discriminate against certain communities are making us less safe. "God forbid terrorists succeed in striking our city because of a politically driven law that undermines the N.Y.P.D.’s intelligence gathering efforts," he said. The editors of the New York Times were unmoved by Bloomberg's fear-mongering defense of racial profiling. "Mayor Michael Bloomberg trotted out shopworn, discredited arguments this week," they wrote, "while defending the constitutionally suspect police program under which hundreds of thousands of innocent New Yorkers have been detained and questioned on the streets every year." They note, "[G]uns were seized in only 0.15 percent of all stops. In addition, only 5.4 percent of all stops resulted in an arrest, and about 6 percent led to a summons. This means that in nearly 90 percent of cases, the citizens who were stopped were doing nothing illegal. In some cases, prosecutors declined to automatically prosecute arrests made in connection with the program because they knew that the stops were illegal." In 2011, 84 percent of all those stopped under the NYPD's Stop-and-Frisk rampage where black and Hispanic, despite respectively representing 23 and 29 percent of New York City’s total population. Similar to its monitoring of Muslims, the NYPD's own data has shown that the Stop-and-Frisk program has done little to reduce shootings in the city. Nevertheless, Bloomberg has defended discrimination and been unrepentant in his support for the program. "Nobody should ask [NYC Police Commissioner] Ray Kelly to apologize — he's not going to and neither am I," Bloomberg said last year, adding, "I think it's fair to say that stop-question-and-frisk has been an essential part of the NYPD's work." For his part, Kelly suggests that those targeted by discriminatory policies should acquiesce to the authoritarian abrogation of their own civil and constitutional rights. "The best thing for a person to do when being stopped is cooperate," Kelly said during a radio interview last August. "Accept it as a fact of urban life." Under Michael Bloomberg's reign, minority communities have been collectively punished for the criminal actions of a few. In his complex world, blacks and Latinos are all potential gun-toting killers, while all Muslims are jihadists-in-training. Yet, an actual gun-toting lunatic who actually tries to murder Bloomberg is an anomaly, an aberration, nothing to be concerned with. Simply something "we just have to deal with." But terrorism? No, never. Not if the perpetrator is white and not Muslim. Glenn Greenwald, a former constitutional lawyer and currently a columnist for The Guardian, has been addressing this double standard for years. "Terrorism," he writes, "is simultaneously the single most meaningless and most manipulated word in the American political lexicon. The term now has virtually nothing to do with the act itself and everything to do with the identity of the actor, especially his or her religious identity. It has really come to mean: 'a Muslim who fights against or even expresses hostility towards the United States, Israel and their allies.'" So while the NYPD continues to terrorize minority communities and the FBI continues to foil phony Muslim terror plots that it itself devises, plans and funds, rest assured that all the well-armed and well-represented white folks in our noble nation will continue to live free from suspicion, scrutiny, and surveillance no matter how much postal poison they send and mass shootings they carry out. Maybe it's not complex after all, maybe it's just complexion. Remember that when you turn off the light tonight. This article was featured in Issue 75 (June-July 2013) of ColdType and crossposted at both ConsortiumNews and Alternet. June 28, 2013 - Speaking this morning on a local radio station, Bloomberg said some truly remarkable things. 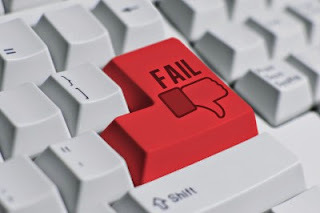 Denouncing two City Council-passed bills that would rein in his racist Stop-and-Frisk policies, the mayor demonstrated he either has no grasp on reality, willfully ignorant, incapable of reading statistics, or simply enjoys lying into a microphone. "The racial profiling bill is just so unworkable," he said. "Nobody racially profiles." Bloomberg continued, "It's society's job to make sure that no one group is disproportionately represented as potential perpetrators." Legislation, oversight, and regulation could also do that job, of course. In order to prove what an arrogant Fascist he really is, Bloomberg concluded, "I think we disproportionately stop whites too much and minorities too little." 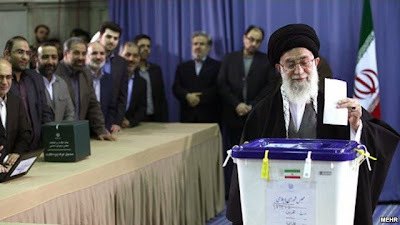 Iranian Leader Ayatollah Ali Khamenei casts his ballot in Tehran in parliamentary elections in 2012. On Tuesday May 21, Iran’s Guardian Council announced the names of eight candidates vetted and approved to run for president in the nation’s upcoming June 14 election. The names of the two most high-profile aspirants,former president Ali Akbar Hashemi Rafsanjani and top Ahmadinejad aide Esfandiar Rahim Mashaei, both of whom were last minute registrants and subject to endless voter and media speculation, were not on the list. The approved candidates are Saeed Jalili, Gholamali Haddad Adel, Mohsen Rezaei, Hassan Rowhani, Mohammad Reza Aref, Seyed Mohammad Gharazi, Mohammad Baqer Ghalibaf, and Ali Akbar Velayati. Brief profiles of all the candidates have been posted by BBC News and the Iranian Students News Agency (ISNA). “[J]ust because the vote is not entirely free and fair,” he writes, “does not mean that Iranians will treat it as unimportant.” Contrary to Parsi’s determination, Majd notes that “it might be a mistake to lump the remaining candidates together,” noting that their economic and diplomatic portfolios present the Iranian electorate with at least some options. Mohammad Baqer Qalibaf, the charismatic and highly regarded mayor of Tehran, is known as a pragmatic conservative; although many reformists and regime opponents inside Iran resent his past as a Revolutionary Guard commander and police chief, others recognize that he is less of an ideologue when it comes to social issues in Iran. As mayor, he has earned a reputation as an efficient manger, and as president, he would likely emphasize improving Iran’s international economic ties. Hassan Rowhani, for his part, is a substantially different candidate than both Jalili and Qalibaf. As a a close associate of Rafsanjani and one-time nuclear negotiator under former President Muhammad Khatami, he could certainly change the tone, if not the substance, of nuclear diplomacy, and thus improve Iran’s relations with the outside world. Furthermore, although he is a cleric, he is not known for hard-line social views. If Rowhani earns the backing of Rafsanjani and Khatami, as some suggest he might, he is likely to introduce familiar faces from earlier reformist administrations into his own cabinet to help determine social and economic policy. For what it’s worth, an online (and admittedly non-scientific) poll on the Iranian news site Asr-e Iran currently shows Rowhani leading the pack with nearly 35% of the vote, while the low-profile reformist candidate Mohammad Reza Aref has almost 21% and Qalibaf just under 20%. Conservative candidates, those most closely aligned with Khamenei himself, trail far behind. The presumed favorite Jalili has barely 9%; Velayati only 6%. Whether this accurately reflects the preferences of Iran’s voters obviously remains to be seen. Journalists Memorial Wall, Newseum, Washington D.C.
Just two days before Palestinians commemorate the 65th anniversary of the Nakba, the names of two Palestinian cameramen targeted and killed by Israeli air strikes in Gaza last November were dropped from a dedication ceremony held to honor "reporters, photographers and broadcasters who have died reporting the news" over the past year. The move followed an Israel lobby pressure campaign led by anti-Palestinian organizations such as the Anti-Defamation League, the Foundation for the Defense of Democracies and the American Jewish Committee, efforts that were openly supported by the Israeli government. Two days after Washington, D.C.'s Newseum announced its intent to honor Hussam Salama and Mahmoud al-Kumi, who were killed in November while working as cameramen for the Middle East-based Al-Aqsa TV, the well-known temple of journalism has decided — for now — not to recognize Salama and al-Kumi, citing their employer's deep ties to Hamas, a Palestinian organization currently designated by the United States as a terrorist group. The Newseum, which honored 82 journalists on May 13, 2013, stated that it had "decided to re-evaluate their inclusion as journalists on our memorial wall pending further investigation," even though just last week, in response to the hysterical reaction to Salama's and al-Kumi's initial inclusion, the museum had affirmed and defended their decision, noting that "the Committee to Protect Journalists, Reporters Without Borders and The World Association of Newspapers and News Publishers all consider these men journalists killed in the line of duty." Indeed, as Joe Catron notes on Mondoweiss, Reporters Without Borders has pointed out, "Even if the targeted media support Hamas, this does not in any way legitimize the attacks," while the Committee to Protect Journalists "found that the Israeli military's official justifications for its attacks on journalists...'did not specifically address CPJ's central question: how did Israel determine that those targeted did not deserve the civilian protections afforded to all journalists, no matter their perspective, under international law?'" The World Association of Newspapers and News Publishers includes both Salama and al-Kumi on its list of "69 Media Employees Killed in 2012," as does the International Federation of Journalists in its report, "In the Grip of Violence: Journalists and Media staff Killed in 2012." Four Israeli attacks on journalists and media facilities in Gaza during the November 2012 fighting violated the laws of war by targeting civilians and civilian objects that were making no apparent contribution to Palestinian military operations. The attacks killed two Palestinian cameramen, wounded at least 10 media workers, and badly damaged four media offices, as well as the offices of four private companies. One of the attacks killed a two-year-old boy who lived across the street from a targeted building. The Israeli government asserted that each of the four attacks was on a legitimate military target but provided no specific information to support its claims. After examining the attack sites and interviewing witnesses, Human Rights Watch found no indications that these targets were valid military objectives. HRW added, "The two men’s families, interviewed separately, said the men were neither participating in the fighting nor members of any armed group. Human Rights Watch found no evidence, including during visits to the men’s homes, to contradict that claim. Hamas’s armed wing, al-Qassam Brigades, has not put either man on its official list of killed fighters – an unlikely omission if the men had been playing a military role." For the Newseum to be bullied into omitting Salama and al-Kumi from its rededication ceremony by avowedly Zionist groups and right-wing media outlets demonstrates that the institution itself is no less a propaganda outfit than Al-Aqsa TV. This shameful last minute decision effectively grants the U.S. and Israeli governments the ability to decide who is and who is not a journalist and who should and who should not be honored for their work. But the decision also reeks of hypocrisy and Manichean double standards. The Newseum is essentially suggesting that sycophantic journalists parroting government propaganda may be legitimate targets in military operations and should be labeled combatants, rather than civilians who enjoy press freedoms and are subject to protection. Yet this only extends as far as the U.S. State Department says it does. The ADL's Abe Foxman called Salama and al-Kumi "members of a terrorist organization advancing their agenda through murderous violence" and "terrorist operatives" who "were working for a propaganda outlet, not a legitimate news organization." The AJC's David Harris echoed these sentiments, labeling Salama and al-Kumi as "brazen terrorists" and "two individuals who were integral to the propaganda machine of the Hamas terrorist organization," that could not be considered "a legitimate media operation." Such terms as "terrorism" and "terrorist" are perhaps the most loaded, politicized, exploited and, consequently, meaningless words in our current lexicon, employed as a bludgeon against critical thinking in order to reinforce "us vs. them" narratives. Apparently, the Newseum has determined that our propaganda deserves respect and admiration, while their propaganda (in this case, documenting on camera the effects Israeli bombs and missiles have on the human flesh of Palestinian people at Gaza's al-Shifa Hospital) should be condemned, targeted and investigated. By this measure, plenty of alleged propagandists grace the memorial wall of the Newseum already, with more added during Monday's ceremony. Mohamed Al-Massalma, a freelance reporter for Al Jazeera, was killed by a sniper while covering the Syrian civil war in Busra Al-Harir in late January 2013. The Syrian journalist, working under the pseudonym Mohamed Al-Horani, was "an activist in the revolt against President Bashar al-Assad," before joining Al Jazeera. In January 2012, Mukarram Khan Aatif was gunned down in the Pakistani town of Shabqadar by members of the Pakistani Taliban. Aatif was a journalist working for Deewa Radio, the U.S. government's Voice of America Pasto-language service. He was among those honored by the Newseum this year. The taxpayer-funded Voice of America (VOA) and its affiliated services have been legally banned from broadcasting or distribution here in the United States for the past 65 years because of a Congressional act prohibiting the government from propagandizing to its own citizens. Only last year was this law reversed; the ban will be officially lifted this coming July 2013. VOA is literally U.S. government propaganda, yet its reporters are accorded due protection from violence, as they should be. Another VOA journalist, Mohammed Ali Nuxurkey, was killed in an al-Shabab bombing in Mogadishu, Somalia, this past March There is no doubt he will be added the Newseum's wall next year. If any distinctions are to be made among different categories of journalists caught in the line of fire or deliberately targeted for murder, international law does not, in fact, favor the Foxman's and Harris' of the world. While war journalists who are not embedded with troops or themselves soldiers taking direct part in hostilities are legally protected by the law of armed conflict, embedded reporters are not necessarily similarly protected. According to international law professor Sandesh Sivakumaran, writing for the Oxford University Press, embedded journalists, while civilians, may be "casualties of lawful attacks" as "[t]he law allows for the targeting of troops and that targeting may result in bystanders or embedded reporters becoming casualties." 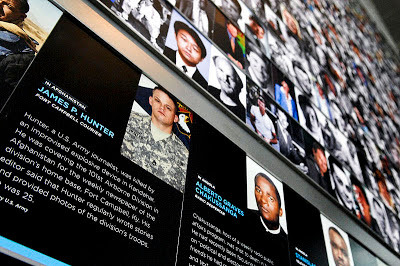 Still, embedded journalists who were killed while accompanying American occupation forces in Iraq and Afghanistan - a policy promoted by the U.S. military in order to ensure positive reporting on American actions (some might call that propaganda) - have also rightly been accorded a place in the Newseum's memorial. Journalists like Spanish reporter Julio Anguita Parrado and German correspondent Christian Liebig, killed by Iraqi missiles in an April 7, 2003 attack on the U.S. Army's 3rd Division headquarters in Baghdad, are honored by the Newseum as is NBC News soundman Jeremy Little, killed in Fallujah in July 2003 while embedded with the Army's 3rd Infantry. Sivakumaran also explains that "[j]ournalists who work for media outlets or information services of the armed forces" are legally considered "members of the armed forces," and therefore "don’t benefit from the protections afforded to civilians and their deaths don’t constitute a violation of the law." As such, the Newseum's glaring duplicity is all the more evident when considering the case of James P. Hunter. A staff sergeant, reporter and photographer with the 2nd Brigade Combat Team, 101st Airborne Division, Hunter was killed on June 18, 2010 by an IED while covering the massive U.S. offensive taking place in Kandahar, Afghanistan, for The Fort Campbell Courier, an Army newspaper in Kentucky. He was an active duty soldier and the first Army journalist to die in combat since 9/11. 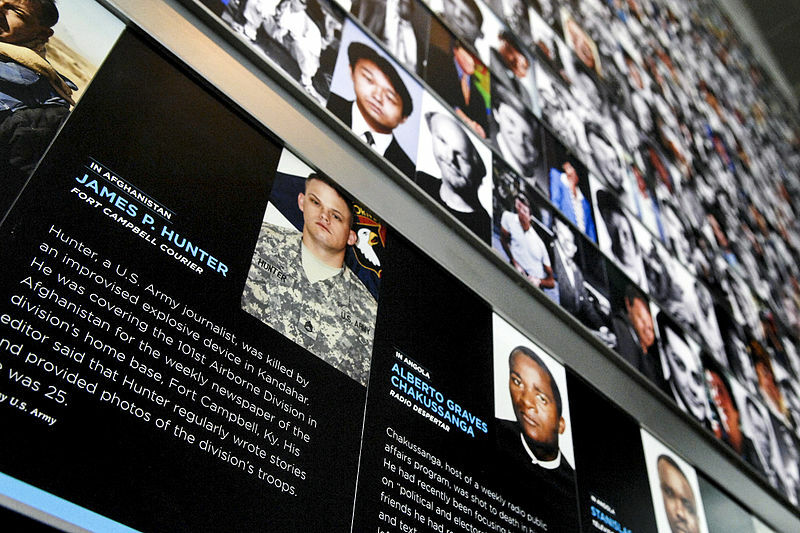 Still, the Newseum saw fit to honor Hunter on its memorial wall. Yet in the case of Salama and al-Kumi, "Israeli officials sought to justify attacks on Palestinian media by saying the military had targeted individuals or facilities that 'had relevance to' or were 'linked with' a Palestinian armed group, or had 'encouraged and lauded acts of terror against Israeli civilians,'" according to Human Rights Watch. "These justifications, suggesting that it is permissible to attack media because of their associations or opinions, however repugnant, rather than their direct participation in hostilities, violate the laws of war and place journalists at grave risk." If repellent statements, including the justification of and praise for acts of violence against civilians, are the benchmark of propaganda and thereby constitute legitimate targeting for death by those opposed to such statements, then countless American journalists and commentators from across the political spectrum would be subject to the same fate as Salama and al-Kumi. Warmongering and incitement abound in the editorial pages of The Washington Post and Wall Street Journal. Liberal commentators like Joe Klein and former White House spokesman Robert Gibbs exalt the extrajudicial executions by flying robot of countless civilians, including a 16-year-old American citizen in Yemen and hundreds of children in Pakistan. Right-wing pundits like Jennifer Rubin and her friends at Commentary and The Weekly Standard openly advocate for the murder of Iranian and Palestinian civilians, endlessly call for permanent war and occupation, support torture and indefinite detention, advocate for the assassination of whistleblowers, scientists and foreign officials, and justify the war crimes of their preferred military forces and governments. Just days before the car in which Salama and al-Kumi were traveling, marked clearly as a press vehicle, was blown up by an Israeli bomb, Rubin published a post praising the IDF assault on Gaza. Hardly able to contain her glee, Rubin anonymously quoted "an old Middle East hand" declaring that, after weeks of sporadic Israeli air strikes ("a form of messaging to Hamas"), "the Israelis escalated. But still they are avoiding infrastructure, hitting pinpoint high-level Hamas target." A recent B'Tselem report on Israel's actions last November, however, "challenges the common perception in the Israeli public and media that the operation was 'surgical' and caused practically no fatalities among uninvolved Palestinian civilians," noting that, "in some cases at least, the [Israeli] military violated IHL [international humanitarian law] and in other cases there are substantial reasons to believe IHL was violated." Israeli air strikes killed 167 Palestinians in Gaza, at least 87 of whom were noncombatants, including 31 minors. Two days after cheering Israeli war crimes, Rubin set her sights on a bigger target. "Israel can keep swatting down Hamas, using air power or, if need be, going into Gaza on land," she wrote. "It has a solemn obligation to defend itself against what was a deliberate escalation by Hamas in the number and quality of weapons launched against Israel's civilian population. But even with the most robust U.S. support this is not a long-term solution. That will only come when Iran is dealt with, either militarily or via regime change." Anyone arguing that Rubin could be targeted with violence for writing her opinions would be labeled sociopathic and lambasted for incitement, and for good reason. And there is no doubt that if correspondents from Israeli Army Radio or employees of the state-run Israel Broadcasting Authority were killed, they would be honored by the Newseum, without so much as a whiff of dissent, let alone outrage. It is evident that, as always, Palestinians are subject to unparalleled scrutiny and suspicion due to the tireless defamation and lobbying efforts of big-moneyed Zionist organizations and ideological zealots. But is it surprising that the Newseum should jump on this bias bandwagon? In the late 1940's, Bugsy Siegel's former publicist Hank Greenspun was recruited by Jewish militias in Palestine to help them fight against both the occupying British and indigenous Palestinians. He hijacked a yacht and laundered $1.3 million through Mexico in order to smuggle machine guns stolen from the U.S. Navy in Hawaii to the prolific terrorist group Irgun, which had blown up Jerusalem's King David Hotel the year before and would massacre the residents of Deir Yassin a year later. Soon thereafter, Greenspun was apprehended by the FBI while attempting to illegally ship surplus combat airplane engines to Haganah. In 1950, he was convicted of violating the U.S. Neutrality Act and fined $10,000 for his arms deals. The same year, he purchased the Las Vegas Review-Journal and renamed it the Las Vegas Sun, serving as publisher for the next four decades. Upon his death in 1989, former Israeli Prime Minister Shimon Peres called Greenspun "a hero of our country and a fighter for freedom - a man of great spirit who fought with his mind and his soul; a man of great conviction and commitment." In 1993, a one-acre plaza in the Jerusalem Botanical Garden of Hebrew University was dedicated to him. In 2006, the Greenspun Family donated $7 million to the Newseum. The museum, which describes Greenspun as a "crusader for justice," named a terrace in his honor. It overlooks Pennsylvania Avenue. This article was featured in Issue 74 (May 2013) of ColdType. The ancient town of Mahallat in central Iran, located roughly halfway between Tehran and Esfahan, boasts Hellenistic ruins from the time of Alexander the Great, Zoroastrian fire temples, castles, caravansaries, lush gardens, mountain caves, and curative and therapeutic hot springs. It’s also home to one of the most modern, innovative, sustainable, eco-friendly and cool-looking apartment buildings in the country, if not the entire region. The primary driver of the Mahallat economy is the mining of travertine, a type of limestone deposited by mineral springs that has been used as building material since the Roman era (the Colloseum is constructed mostly of travertine). Because of the inefficiency of stone-cutting technology, the manufacturing of travertine tiles produces over 50% of excess waste. This means that less than half of the mined material is actually used in the final product. The incredible amount of unused and discarded stones contributes to the pollution of the natural environment. The recycled stones used for the exterior create a subtle effect on geometry of the project, which consist of façade with emphatic angles. Slight roughness of mixed recycled stones creates somewhat warmer texture, effectively complementing sharply tailored façade. As a result, the project, which speaks the language of modern architecture, uniquely blends with verdant trees and surroundings of Mahallat, an old town, which has seen more than a thousand year of history. 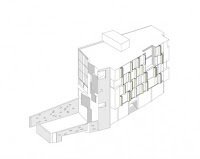 Such coherent theme of locally-recycled stones is also reverberated in the interior of the project, where simple structure is accentuated by stone walls, creating a space that is expressed in a natural yet intimate manner. Construction of "Apartment No. 1" began in 2008 and was completed in 2010. That year, it took first prize for residential structures at Iran’s Memar Awards. 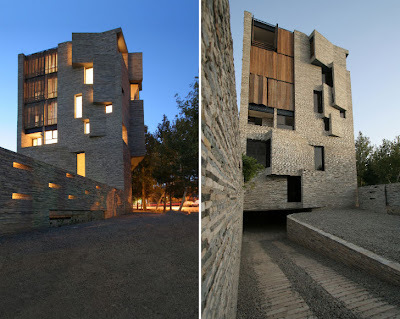 In 2013, the project was shortlisted for an Aga Khan Award for Architecture. The building has already influenced local builders and masons to begin utilizing recycled travertine in their own constructions. More photos by AbCT associate Omid Khodapanahi and a short film about the project after the jump.